Silk from the Hartz is a family business in the beautiful town of Index, Washington, USA, in the foothills of the Cascade Mountains. Warren Hartz, the artist, hand dyes each item to create unique pieces of decorative and wearable art. Silk is hand painted with dyes, not paints. Paint sits on the surface, stiffening the fabric, while dyes become part of the fabric, leaving it soft and silky with a sheen that sparkles in the light. 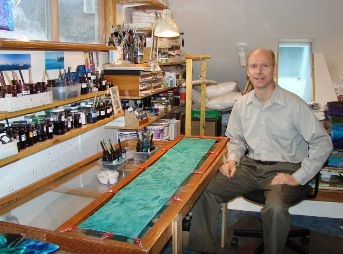 Warren has experimented extensively with resists, dyes, and techniques to create original designs on silk. Silk is stretched on a frame and dyes are applied with Sumi brushes, while resists are applied with sponges, leaves, or fine line applicators. Wet dyes are often sprinkled with salt, creating a pattern as the dyes dry. The silk is steamed for 3 hours, then rinsed, to set the dye and bring out the vibrant colors and wonderful softness of the silk. See our HartzHomestead YouTube channel for videos on dyeing and wearing silk. Click the Subscribe button for upcoming videos such as painting orchids on a black tie time-lapse, dyeing leaf print scarves, and how to wear an infinity scarf. 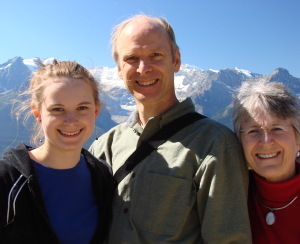 Also guitar music, Cascade Mountain scenery, growing fruits and vegetables, bears, birds, and Max the dog! Click the Bell to receive notifications when we upload new videos. Click on a Category to see our hand dyed silk scarves, ties, wraps, tank tops, camisoles, chemises, hair scrunchies and eye pillows. Use the Filter to sort by color, design, price or size. Call or email us for custom colors or designs. Warren has been an artist all his life, working with wood, paint, candles, photography and music. In 2000, he began dying silk while teaching art to youth in Skykomish. Having a red/green color deficiency, he often consults his wife on colors. He mixes dye colors with formulas he's developed, using over 30 colors in some items. Blending art and science, each piece is individually hand dyed so you are wearing a unique work of art. To see, feel, and try on our full range of silk products, come visit our booth at one of the many craft fairs we attend throughout the Puget Sound area May through December.